Summer officially begins with this weekend’s Memorial Day celebration. While it is a time to reflect and remember those who gave their lives for our great country, it is also traditionally a time for families to get together…and weather permitting…grill! Here’s a terrific slaw from Skinny Kitchen that goes well with any grilled entree. Skinny Kitchen’s Nancy Fox says, “I love all kinds of coleslaw, particularly this flavorful one! Using broccoli slaw is a wonderful alternative to typical cabbage. Such a versatile side dish for fish, beef, chicken, pork, hot dogs, burgers and more. You’ll love how quick it is to make.” The skinny for each serving just 38 calories, 1 gram of fat and 1 Weight Watchers POINTS PLUS. 1. To make the coleslaw dressing–In a small bowl, mix together mayonnaise, yogurt, mustard, vinegar and honey. Refrigerate until ready to serve. 2. Just before serving, add broccoli slaw and scallions to a bowl. Toss with dressing. 3. Leftovers can be refrigerated and served the next day. It still tastes great. Broccoli slaw is made with broccoli rather than the traditional cabbage. Broccoli slaw is incredible versatile—it’s equally tasty in raw or cooked form, with a sweet or savory kick. Many people that don’t like the taste of cabbage do like broccoli slaw. 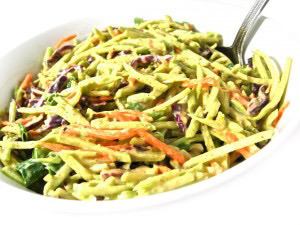 Broccoli slaw has a bounty of vitamins A and C, plus an impressive fiber content. It boasts all the benefits of broccoli, simply in shredded form (along with a few carrots and the occasional purple cabbage leaf). Next ArticleMy High School Reunion…Why Bother? Thanks so much for sharing my coleslaw recipe. I hope everyone enjoys it.